ASTONISHING footage has emerged of a cyclist being wiped out by a kangaroo mid-leap on Australia Day - of all days. 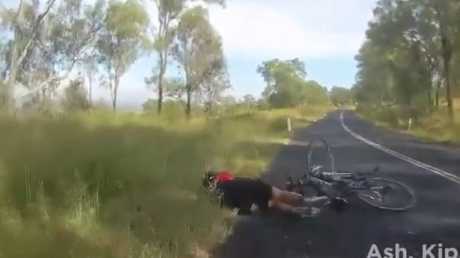 The unsuspecting cyclist, Rebecca, can be seen riding along a quiet country road west of Ipswich before the kangaroo leaps from the bush into her side, flooring her instantly. The marsupial, however, appears unscathed and hops away into the bush. "After we crested a hill, about 30km/h into the ride, we slowed for others to catch up," fellow cyclist Helen said. "Two of us also saw kangaroos on both sides of the road. "The ones on the left hopped away, the one on the right waited to join its mob." That's when it jumped out, into the path of the cyclist. Two other cyclists on the ride looked after her until the ambulance came. 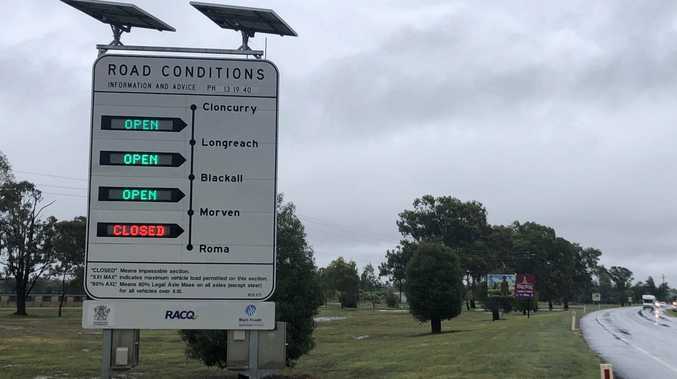 "She was released from hospital that afternoon, with stitches in her knee and her right arm in a sling, for the shoulder-injury from the kangaroo's impact," Helen added. "Within a day she was having a rueful laugh about it all and worrying about the work days she will miss."